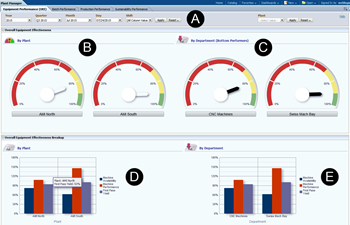 The standard of Oracle’s Manufacturing Operations Center (MOC) ships with a dashboard called ‘Plant Manager’ which includes several reports that output Overall Equipment Effectiveness (OEE) Key Performance Indicators (KPIs) for various levels of the enterprise such as plant, department, resource or equipment. 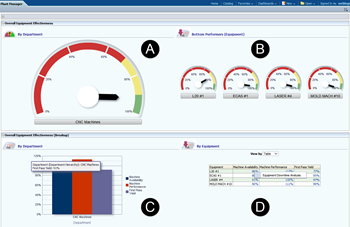 When the plant manager dashboard initially is opened it shows ‘the big picture’, OEE values for one or more plants. In the first area on top (A) a period of time for which OEE should be output as well as shifts and plants can be selected. Below, on the left side, the measured OEE data for the plants (B) is shown. Left to it OEE values for departments (C) with the lowest performance are output. The lower area contains graphs that show machine availability, machine performance and first pass yield again for plants and departments. Clicking on one of the results for the machines leads to a more detailed report for the selected item, machine availability opens equipment downtime analysis, machine performance opens equipment efficiency analysis and first pass yield opens equipment scarp analysis.